Fort George is a national historic site of Canada and was the scene of many battles during the war of 1812. Built in 1802 by the British army after the signing of Jays Treaty which required them to leave nearby fort Niagara. It became the headquarters of the areas British forces and also for its local militiamen. It saw a lot of action being attacked a number or times by both sides, such as its first capture by U.S forces in May of 1813. After being used as a base to invade the upper regions of Canada it was retaken in December of the same year after its forces suffered two major defeats at the battles of Stoney creek and Beaver dam. 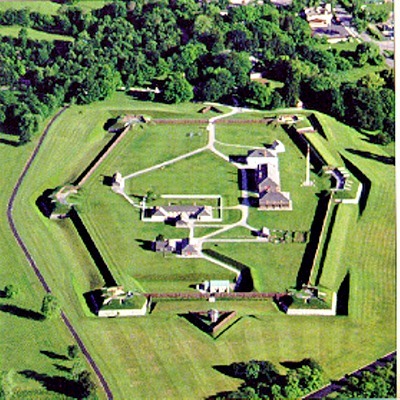 During the 1st and 2nd world wars, the fort was used as a military training base and operated under the name camp Niagara. The military eventually abandoned the fort in 1965. Today the fort is a tourist attraction and is maintained by Parks Canada who keep it in its original early 1900's style. If you wish to visit please check with the venue directly to check any seasonal opening times. The fort is thought to be one of the most haunted places in Ontario, with it being featured on TV shows "Creepy Canada" and " The Girly Ghosthunters". As you can imagine with it being a fort and all, that there were a lot of deaths within its walls, not only from direct attacks but from the many people who would have been wounded elsewhere and taken back to the fort for treatment, creating the foundations for a good haunting. The most well known ghost at the fort is that of a woman who started out haunting a mirror in the officers quarters. There were claims for years that people would see the reflection of a woman combing her hair in the mirror as if she were standing right in front of it, and these claims were reported by many people. However in recent years people have also claimed to have seen her sitting in a chair in the room and staring out of the windows when its known to be empty, as if she has somehow escaped the confine of the mirror. One particularly spooky story come from a tour guide who saw a young boy talking into thin air, when he approached the boy and asked who he was talking to the boy described a man wearing the military uniform of the forts operating days, even though he had not been shown the uniform they were before this happened. The power magazine is known to be a hotspot for paranormal activity, and its also the only original building from the fort construction. Shadowy figures have been seen moving around the walls in this building and also within the tunnel which leads to it. On a couple of occasions after the shadows were first seen the door locked behind the staff inside, as if seemingly trying to trap them.